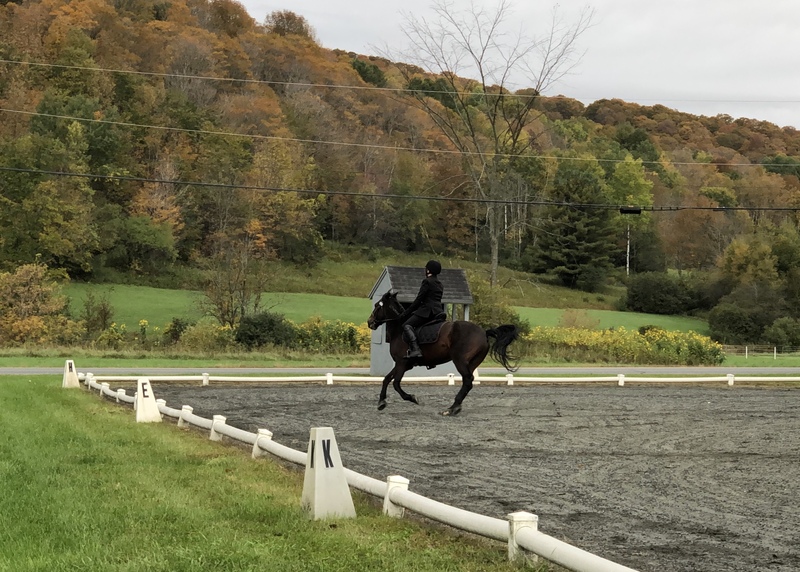 We got to the facility bright and early only to discover that parking was in a distant field and it was a good 10 minute ride from the parking lot to the dressage area. Also – and this is something you can only find out through insider knowledge – we should have stopped on the side of the road to get our entry packets from the front porch before driving to the parking lot because it was a lot walk away. Luckily, one of the people near us was unhooking her truck and gave my husband a ride over with her to pick up our packets. 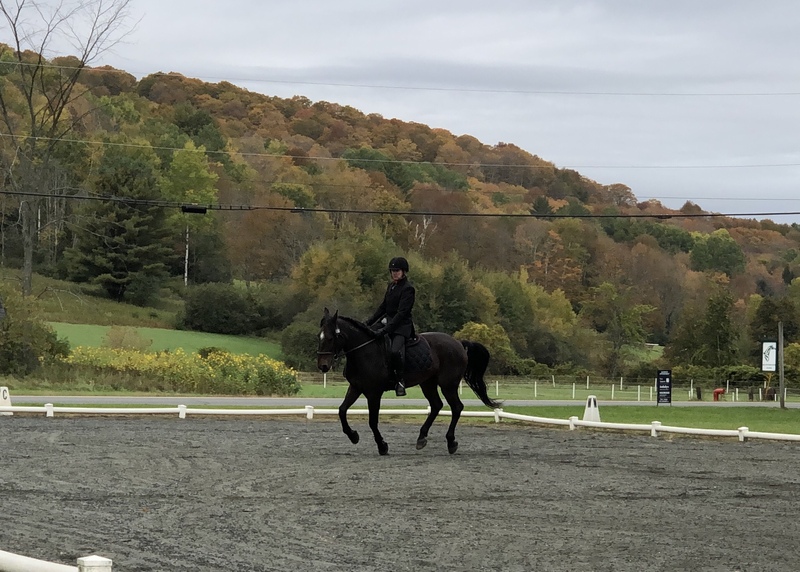 We tacked up and make the trek over to the dressage warm up – and it was truly a trek. 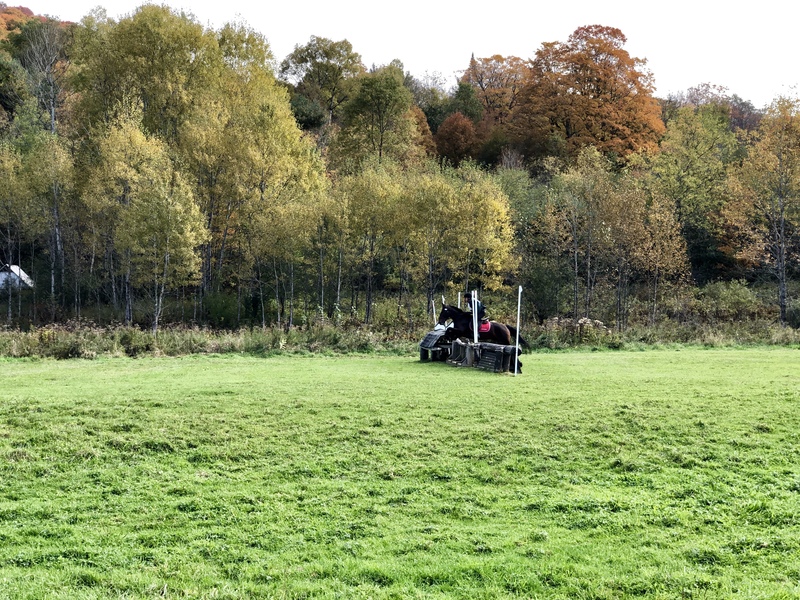 We had to go up and down hills, across fields, and even cross a stream. Then we got to walk past some very frisky pasture horses who thought it was racing and bucking time. 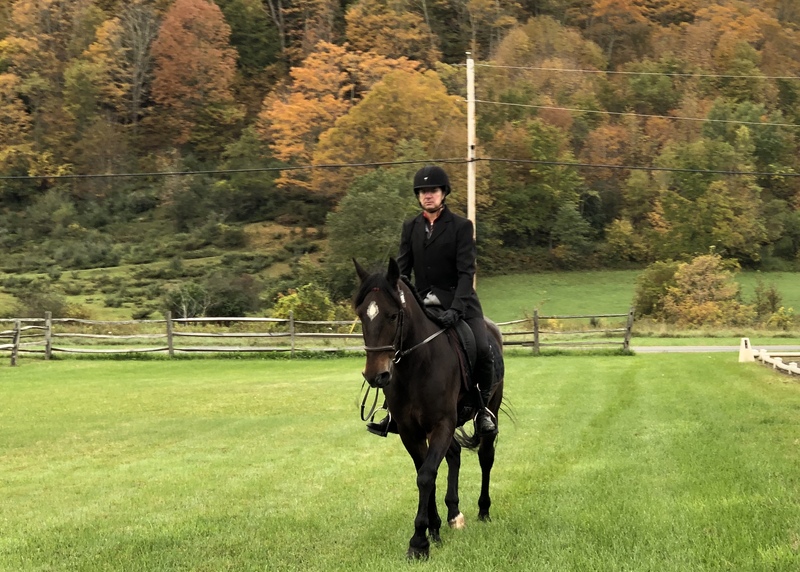 Luckily our two boys were fine, but we did have to assist in some creek crossings and help another woman ride her ottb past all the pasture horses at various points in the day. My husband decided to do this event at the BN level. 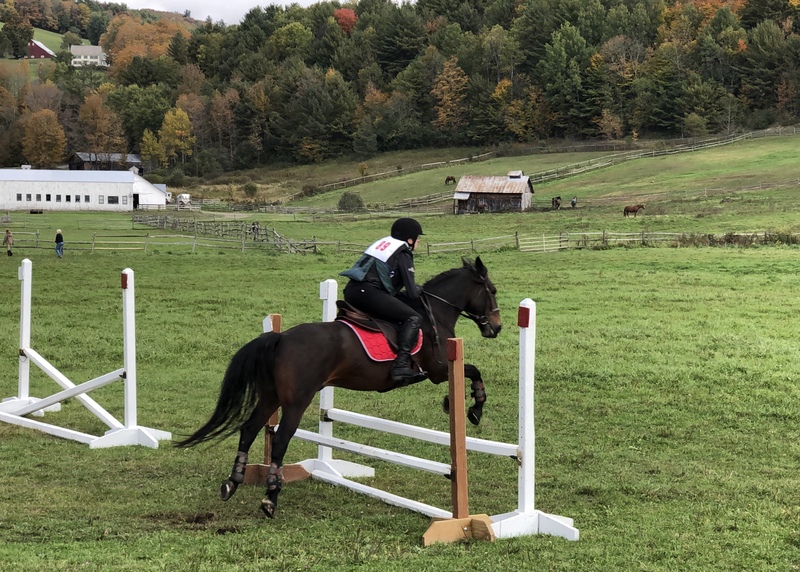 Mostly since Eugene hadn’t done cross country in over a month and had almost no experience with riding on grass, he felt like starting at a comfortable division and moving up later. The test started off really well with two 8s for the entry and first circle. 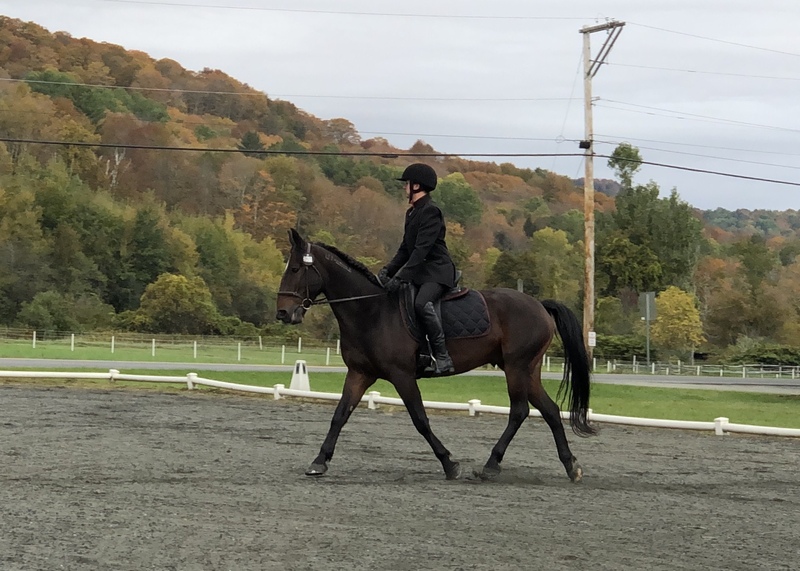 They got a good score for the transition to trot (7.5) and a decent score for free walk (7 with a comment of “some resistance”). 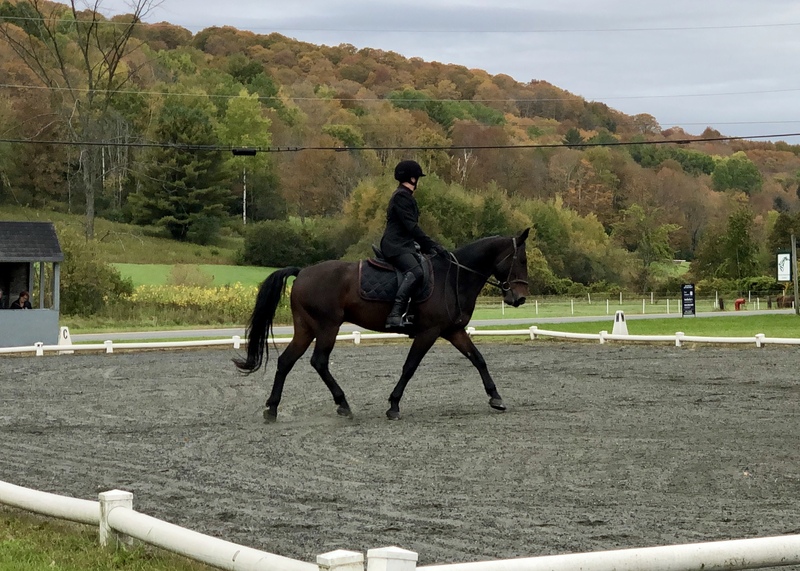 And proceeded to do an okay second trot circle. The judge gave them a 7, but it wasn’t very pretty in person. Eugene was above the bit and not bending. I asked my husband afterwards if he knew he was on the wrong lead and he said he knew, but the whole test was going so terribly he didn’t bother to fix it because there was “no point.” I definitely laid into him for that. A) It really wasn’t that bad of a test. Not as good as they’re capable of sure, but not the worst. B) Even if he didn’t are about the score, not fixing it just reinforces the behavior for Eugene. C) He really should have fixed it for the sake of his score because he went from 8s and 7s to 2s and 1s. They were in 3rd out of 3. 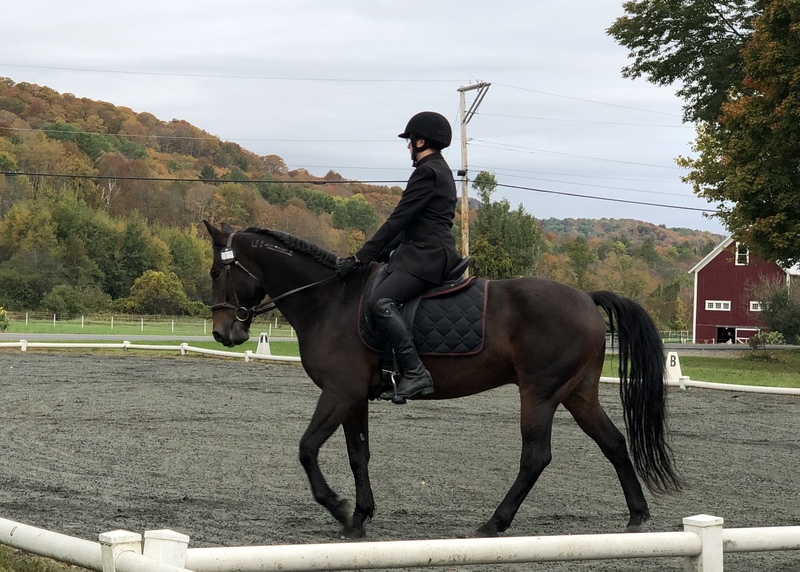 We had my dressage next then walked back to the truck to change tack and back past the dressage area for my cross country and then all the way back to the parking area for my stadium and back – again – to the cross country are for my husband’s cross country. 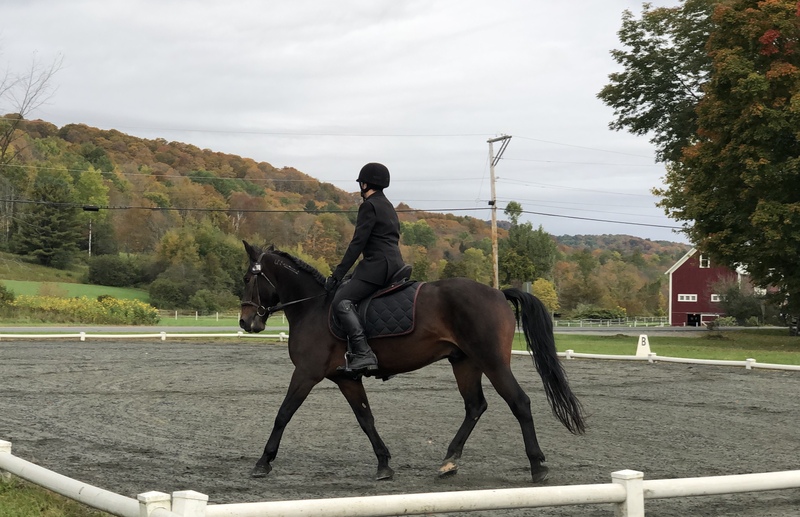 Every trip was a 10+ minute walk though we shortened it a bit by trotting some as we were hustling to get my rounds done before he started his. 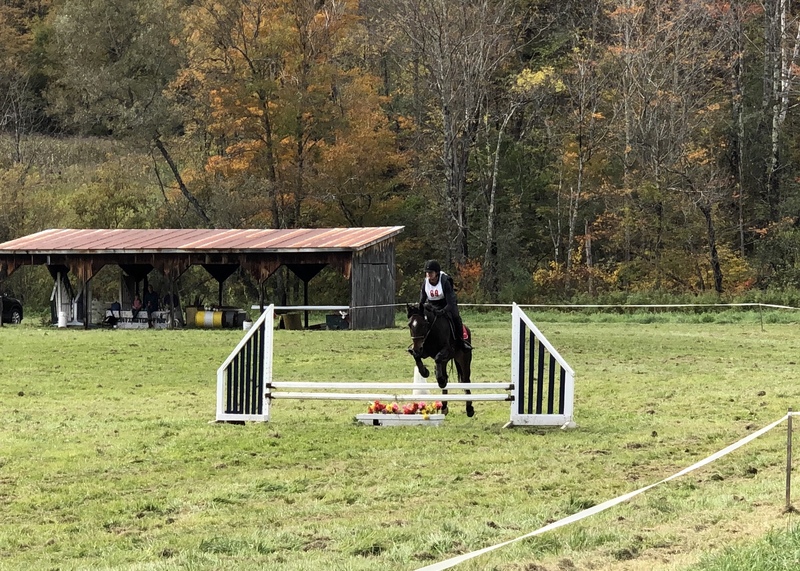 Because of all the time going back and forth, we had no time to walk the course and both had to run it “blind” Luckily, they don’t time their schooling events and my husband knew he could take his time, circle if necessary, and find the jumps by number. A woman who’d done the course before was nice enough to talk him through it while we were waiting in the warm up too. There were some radio issue before their XC and we ended up hanging out for a while. No big deal when it’s this freaking gorgeous out. I swear this valley was about a week ahead of everywhere else for fall colors; everything was gold and red. Finally it was time to go. 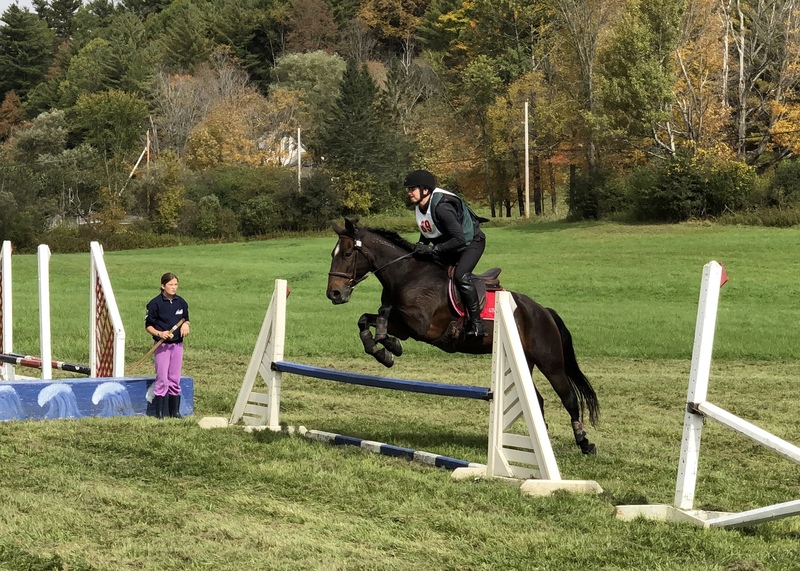 I could only see their first and last jumps from the starting area, but my husband said the whole course rode really well. He though he was lost at one point, but he wasn’t and he got over everything clear. I did catch a picture of them galloping across the background of the valley. It was seriously enjoyable to just stand and look around, especially when the sun and sky would peak out from the clouds for a few moments. We actually looked at buying the property that borders this facility in this direction – you just can’t see it for the trees here. All of Vermont is pretty, but this valley is really very special. Then it was time to head back to the parking area and past it to stadium. 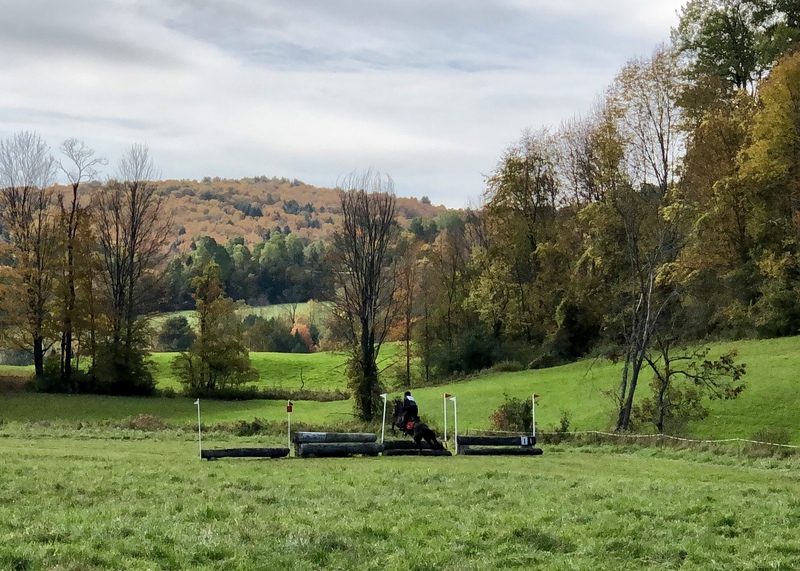 Although Eugene was physically warmed up at this point, I suggested jumping one stadium warm up jump just to remind Eugene that these were colorful sticks and not XC jumps. I recommended this after my own experience of Levi slamming to a stop at the crossrail in warm up even though he too had just done XC. Because apparently it was new and different and needed staring at. Of course, Eugene didn’t care. The stadium course was pretty easy: big loops and lots of space between each jump. But it was a really cool grass arena with a little bit of terrain. Eugene was pumped from XC and just aced the stadium. 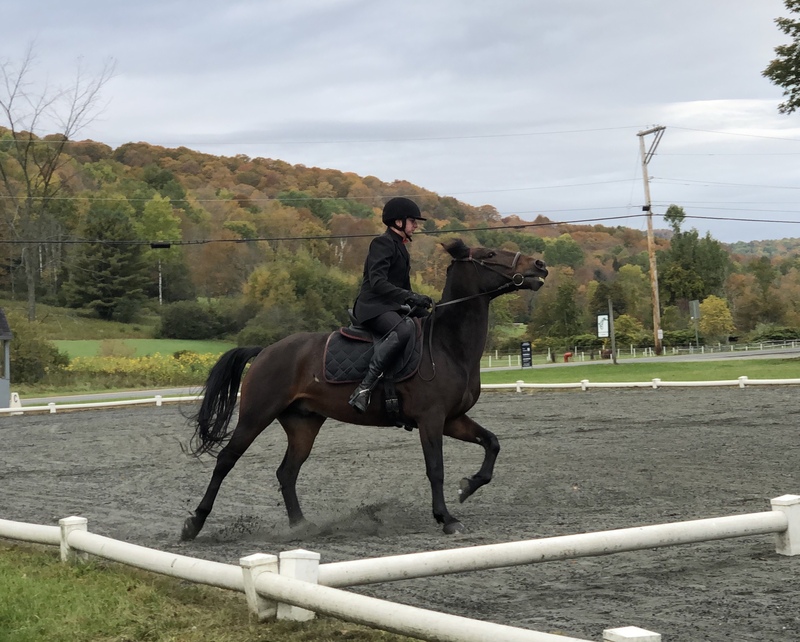 He even managed to clear the 2 stride combination (which have always been really hard for him) without an issue. 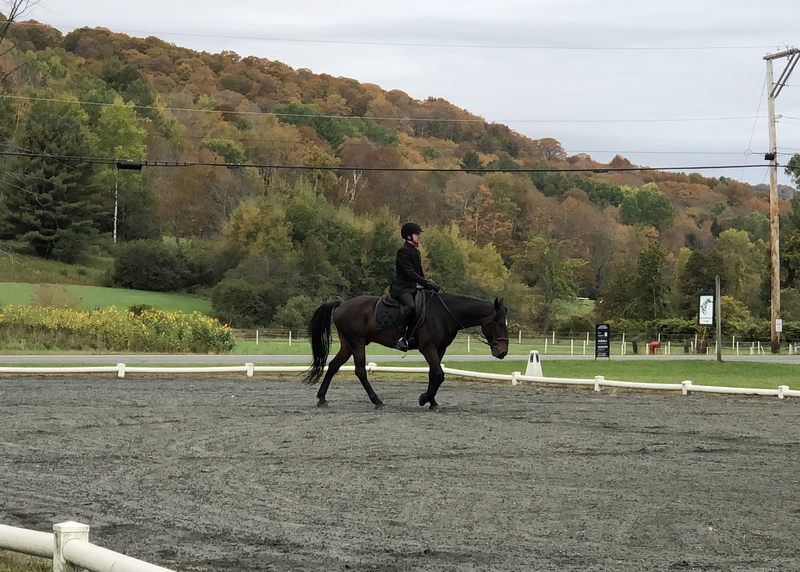 They ended up finishing on their dressage score, which is awesome for them. I think starting out at BN after the move was a good confidence building move for them. It was a really great event too. The facility was gorgeous and the weather stepped up to make the day enjoyable. Everyone we met was super nice too and we had a lot of fun. Breathtaking. Wow. Good job to the men too getting it done. It was a successful event for them. Sounds like a great day! Huntington Farm is one of my most favorite venues! It’s for sale!!! I hope they keep doing the events though; I want to be able to complete there in the future. If you ever want to compete at Huntington you’re welcome to come stay with us. Looks a lot like it is here in Ontario! It’s such a pretty time of year. 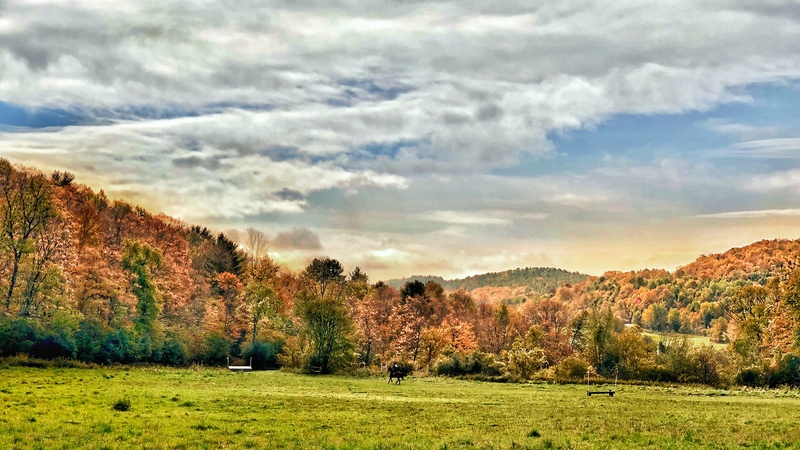 omgosh what a gorgeous farm – and so different from what Eugene would be used to!! seems like a great choice to get out there at BN where everything felt relaxed and easy, they look like they’re having a blast! 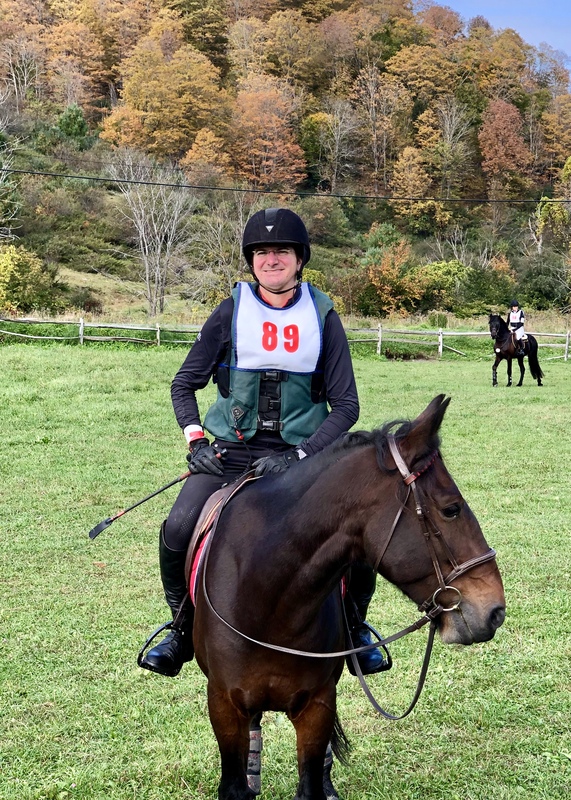 It was a totally different type of cross country. I really enjoyed it though. Vermont is really so beautiful. I love that photo of them galloping in front of the mountain. I agree with you both about the softer start for the first time out after the big move. It went really well! Kind of annoying about the super long walk, but a lot of places are like around here. At least the views are pretty! It was certainly a pretty walk back and forth; we just weren’t prepared for that. Very pretty! 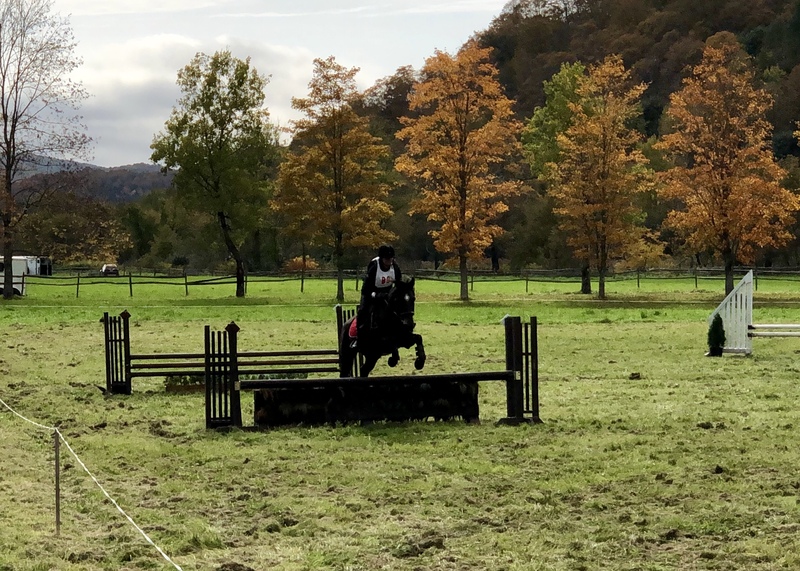 Interesting that you go straight from XC to show jumping, I’ve only seen it the other way. I’ve also never seen XC to Stadium back to back like that. Usually stadium is the warm up for XC in a 1 day. It ended up working out just fine though. OMG that’s so breathtaking. I’m glad Eugene and the hubby did so well! It’s super pretty here right now. It looks like a stunning venue. 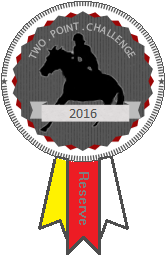 Congratulations to Team Eugene! It’s so strange to see some of my favorite “cast and crew” on a new background, but I love it!! It’s nice to be exploring new places.